It’s unclear as to why the new calendar year marks a time of renewed motivation and the increased internal desire to improve oneself. Perhaps it’s the guilt from the typical holiday weight gain, or maybe people spend too much time sprawling out on the couch rather than exercising and breathing the fresh air outside. In any case, there’s no doubt that many folks tend to reinvent themselves after the New Year. Whether you struggled a little bit during the end of last semester or you’re tired of the same ol’ habits in your life, it’s important to know that it’s never too late to make these small but meaningful adjustments. Let’s Make 2019 The Best Year To Date! 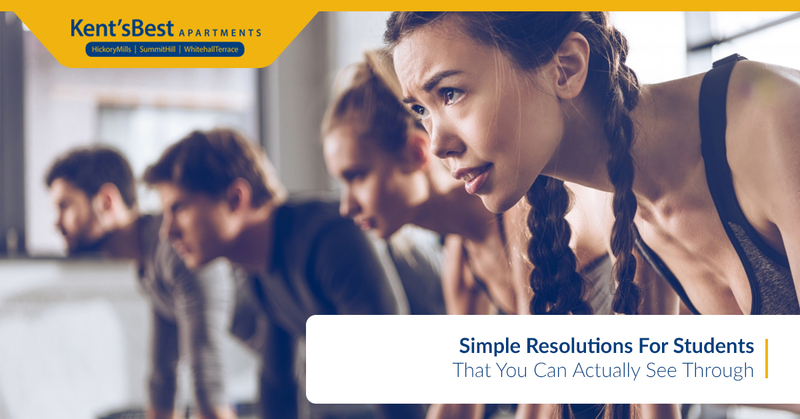 While we’ll leave any major personal changes up to your discretion (it’s your life, after all), we’ll focus today’s blog post on several practical, student-friendly resolutions that you can actually incorporate into your daily life before the Spring 2019 semester gets rolling. Hopefully you’ve secured a great living situation with Kent’s Best Apartments before last semester, but if you’re still in search of student apartments near Kent State University, we have you covered! Feel free to learn more about the Whitehall Terrace, Hickory Mills, and Summit Hill apartments today. There’s a strong link between your body’s health and your academic performance. Of course, you’re here to study and invest in your career here at Kent State University, but you’re not doing yourself any favors by neglecting your state of health. It’s important to exercise at least a few times per week, even if that means heading into the on-campus fitness center because it’s cold outside. Never be ashamed about improving your fitness at the gym, because at the end of the day, that’s what everyone else is there for! By stimulating your brain’s endorphin production, you’ll (surprisingly) experience more energy, more mental clarity, and the stress-melting benefits accompanied by endorphins. Why not manage your academic stress before it starts to hit you in full force later in the semester? Screens are everywhere in our lives whether or not you give it a second thought. Chances are, you’re looking at a projector screen or your laptop during a lecture, you’re using your laptop to study at the library, or you’re looking at your phone walking from your Kent apartment to campus. After it’s all said and done, you’re probably relaxing with a little Netflix or Hulu. Hey, there’s nothing wrong with that, right? It’s true that watching an episode or two of your favorite show isn’t a big deal, and the modern day reality of work and education is screen-dominated. However, if you’re looking to maximize the time in your day and get better quality sleep at night, limit your viewing time and put your phone on “do not disturb.” Give yourself five or ten minutes of no screen-based information before you plop your head on your pillow, and you’ll find that it’s that much easier to drift off to a peaceful sleep. You don’t have to plan your entire day around talking to your mom or dad, but you also shouldn’t go weeks and weeks without contacting them. Parents are naturally invested in the happenings of their children because…well, they brought you into this world, and they may very well be the ones funding your higher education. The least you can do is throw them a call once or twice a week, just to let them know how you’re doing, talk about any struggles or challenges, and celebrate any wins. They’ll certainly appreciate it, and you can rest assured knowing that your folks know what’s going on — at least, as much as you’re willing to tell them! It’s easy to stay properly hydrated, but most people don’t drink nearly enough water on a daily basis. This, of course, is literally the most integral aspect of anyone’s survival, but drinking ample amounts of water does so much more than maintain your vitals. Sure, you may have to visit the bathroom a little more often than you’re used to, but you’ll find that you’re able to think more clearly, have more energy in the mornings, ward off headaches, and cut down on sugary drinks in place of the good stuff, H2O. College is the primetime of your life, and while thousands of other students may also be here to learn in their own primetime, this experience is about you, not them. Don’t waste precious mental energy wondering about what your classmates think about your outfit, or if your rushed hairstyle is the laughing stock of your lecture hall. Here’s the answer: it’s not, because people tend to take note of these matters a lot less than our self-conscience would suggest. Ultimately, you’re here to learn, grow, and figure out what it is you’d like to do for a career and how to go about studying it. Nothing else is as important! Kent’s Best Apartments is here to help support the success of our collegiate community — including you! From our Kent Apartments to your time on campus, we wish you a great Spring 2019 semester and a Happy New Year. Feel free to contact us at any time. Reference Our Articles To Learn More!